Photo of grass fringed Lightning Lake in Manning Park (E C Manning Provincial Park), British Columbia, Canada. Tall feathery grass fringe Lightning Lake in Manning Park (E C Manning Provincial Park), British Columbia, Canada. 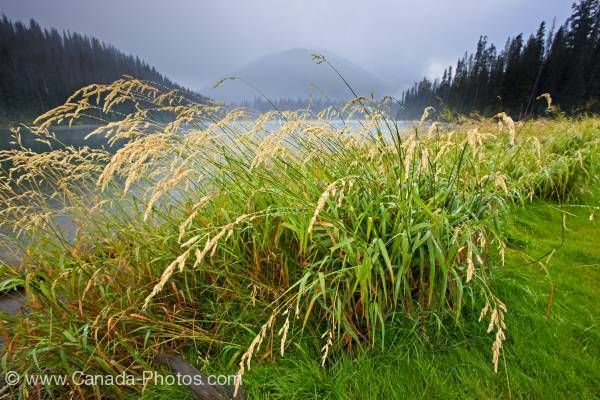 Tall grass with its wheat coloured feathery heads blow in the soft breeze along the shoreline of Lightning Lake. The thick foliage of long green leaves densely populates the borders of the lake. Tall dark evergreens surround the calm lake adds to the misty backdrop. Grass fringed Lightning Lake in Manning Park (E C Manning Provincial Park), British Columbia, Canada.